Select a question link to open the answer. 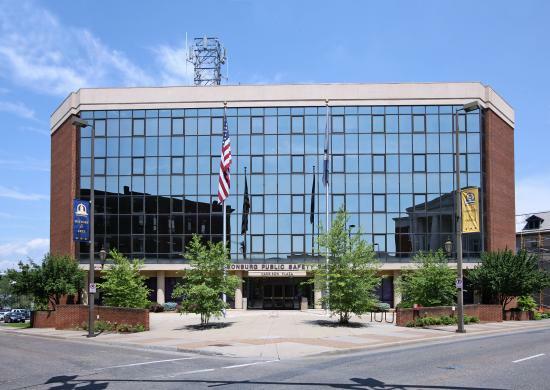 Questions are sorted into categories based on department, but there are also special categories for the Community Development Block Grant, Harrisonburg Citizen Academy, How Do I, WebTrac, and Zoning FAQ. You can also select a category from the list on the right. I've seen these new markings of a bike with two chevrons/arrows above it on the street. What do they mean? These are "Shared Lane Markings", aka "Sharrows", which are intended to guide bicyclists to the best place to ride on the road, avoid car doors, and remind drivers to share the road with bicyclists. Although it is the motorist's responsibility to check before opening their door, riding too close to parked cars (in the "door zone") is still a common mistake that can lead to serious injury. On some streets, bicyclists riding over the sharrow marking will take the entire lane. Aren't they suppose to move to the right? According to Virginia State Code Section 46.2-905, bicyclists are to stay to the right when riding less than the normal speed of traffic except to pass other bicyclists or vehicles, to prepare to make a left turn, when necessary to avoid conditions (including fixed or moving objects, surface hazards, or substandard width lanes too narrow for a bicycle and vehicle to travel side by side) that make it unsafe to continue along the right. Moving to the left in the lane to avoid car doors, for instance, even if it means taking the entire lane, is permitted by the State Code. If I see the bike (sharrows) markings in a lane, is the lane only for bikes? This marking is used for shared lanes; lanes that are used by bicyclists and motorists. Shared lanes are different than bike lanes which are set aside for bicyclists and are marked by a solid white line and a different symbol. If I don't see the bike (sharrows) markings, then it’s not a shared lane and bicyclists aren't suppose to be there? No, bicyclists can ride on any roadway, except for those designed as limited access highways with signs explicitly prohibiting bicyclists (such as Interstate 81). Cyclists are allowed on every street regardless of whether there is a marking or sign for them unless stated otherwise. I've never seen the bike (sharrows) markings before. Why are they being used now? In 2009, the Federal Highway Administration approved the use of Shared Roadway Markings ("Sharrows") in their Manual on Uniform Traffic Control Devices (MUTCD). Many cities around the country are using sharrows on streets that are both popular with bicyclists but may be too narrow for conventional bike lanes. The overall goals are: to improve the position of bicyclists on roads without bike lanes, reduce bicycling on sidewalks, assist bicyclists with lateral positioning in a shared lane with on street parallel parking in order to reduce the chance of a bicyclist's impacting the open door of a parked vehicle, encourage safe passing of bicyclists by motorists, and reduce the incidence of wrong-way bicycling. 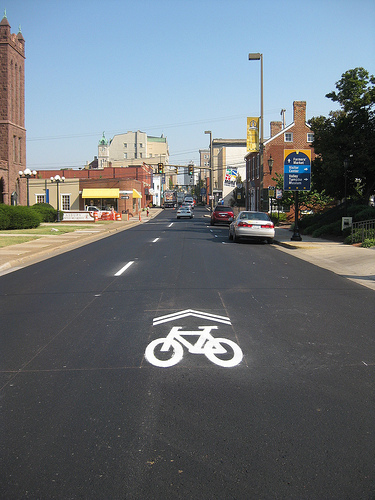 No, these markings will be on streets that are designated in the City of Harrisonburg Bicycle & Pedestrian Plan. There is a street near my house that has sharrows on it. Why are there so many markings on the pavement? The MUTCD states that "if used, the shared lane markings should be placed immediately after an intersection and spaced at intervals not greater than 250 feet thereafter." Who Do I Notify If the Traffic Light is Not Working Properly or a Traffic Sign is Missing/Damaged? Please submit a service request to the Public Works Department or call Public Works at 540-434-5928. 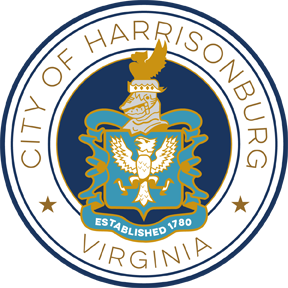 After hours (7:30am-4:00pm), please call the Harrisonburg Police Department at 540-434-4436. Can the City Do Something About Speeding Traffic and/or Cut Through Traffic in My Neighborhood? Neighborhoods with speeding traffic and cut through traffic concerns are encouraged to participate in the Neighborhood Traffic Calming Program. If the dead animal is on private property, it is the landowner's responsibility to dispose of the animal properly. If the dead animal is on public property and is domesticated (cat, dog or other pet), call the Animal Control Office: 540-437-2671. If the dead animal is on public property and a non-domesticated (wild) animal, call the Public Works Department Office: 540-434-5928. 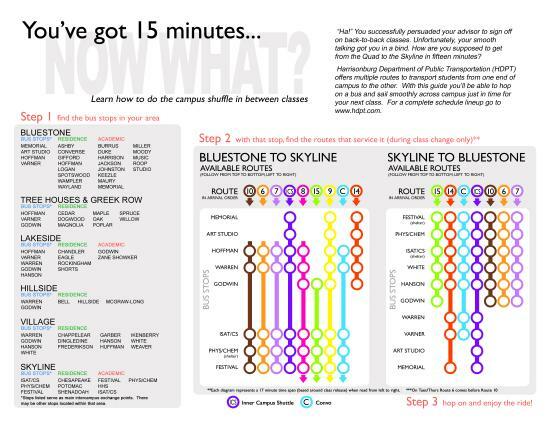 The snow plow trucks run on a primary route system, which includes approximately 60% of the lane miles in the City. The trucks remain on these primary routes until the snow/precipitation has ended then they begin on the remaining streets. It is important to remember that the number one concern is to clear the main streets for emergency traffic. Who Can I Contact to Fix the Curb and Sidewalk in Front of My Home? The Department of Public Works has an ongoing replacement/repair program, in which they annually take inventory of all city curb and sidewalks and determine their condition. Public Works then fixes the structures depending on the condition and usage. How Do I Request a Street Light on My Street? Please call the Public Works office at 540-434-5928 to make a request. They will review the request and forward acceptable requests to the Harrisonburg Electric Commission. How Can I Get Composted Leaves? The Public Works Department no longer offers composted leaves. Please call the Public Works Department at 540-434-5928, and supply your name, address and phone number. After they have received this information, you may come to their office (320 East Mosby Road) and pick one up or Public Works can deliver a recycling bin to your door within five to ten business days. Can the Real Estate Office Help Me With Any Sales Information? The Real Estate Office can run sales by zoning, neighborhood, and use code. Real Estate also has a map that they put the sales on. All sales are public information. Real Estate can also fax or email the information. What Do I Do With the Tax Bill That I No Longer Own? You can either call the Real Estate Office and they will send a new bill to the owner, or you can mail it back or give it to the new owner.